VR And AR Technologies Can Help Real Estate Agents Save Time And Deliver A More Alluring Experience For Clients. Imagine being able to take an open-house tour of a home for sale in your town without actually driving to the property; or, while walking your dog, taking a photo of a house in a nearby neighborhood and finding out how much it last sold for. These kinds of experiences are coming from a real estate agent near you, if they haven’t already. Virtual and augmented reality are poised to grow in all kinds of industries in the years ahead, from manufacturing and logistics to healthcare. IDC predicts that worldwide revenues for the VR/AR market will reach $13.9 billion in 2017, which would be an increase of 130.5 percent over the $6.1 billion spent in 2016. The research firm expects to the market to then explode over the next few years, reaching $143.3 billion in 2020. While VR produces a computer-generated reality that users can interact with (usually via a headset), augmented reality involves digital information being brought into a user’s field of view and overlaid onto the real world, which they observe usually through a smartphone’s camera. One industry that VR and AR have already started to transform is the real estate business. Long associated with in-person tours and the enticement of empty apartments or houses (preferable to those filled with the current owners’ furniture), house hunting stands to gain as AR and VR make the process more convenient for real estate agents. The technologies can also deliver a more engaging experience for potential buyers and lead to increased sales. Here is a quick primer on the ways in which VR and AR can reshape the real estate market. Virtual reality allows real estate companies to provide prospective buyers with immersive, 3D tours of properties. Matterport, a 3D camera technology company, is working with web-based real estate firm Redfin to provide 3D walkthroughs. Prospective renters in Arlington, Va., can now tour apartments using VR. Developer CRC is partnering with Immerse Virtual Reality Nation to create a VR tour of a new apartment building still under construction, according to an ARLNow report. “Using an HTC Vive headset with two motion sensors, residents can experience a realistic, 360-degree home tour of what their apartment will look like after construction,” the site reports. Open houses often mean that potential homebuyers are walking through a house fully furnished by the owner who is selling. AR allows potential buyers to see the home with their own furniture or styles in mind. Virtual staging technology company roOomy allows buyers to visualize any apartment or room in a house in the way they would want to decorate it. “Drawing from a catalog of more than 100,000 furniture and household items, roOomy allows you to upload a picture of a room and virtually decorate it to reflect your personal tastes,” Forbes reports. “Agents, investors and buyers alike can take advantage of these amazing tools.” RoOomy works in concert with Google’s Tango, an AR technology. VR can also help backers of a real estate project visualize the property for potential buyers before construction even starts. 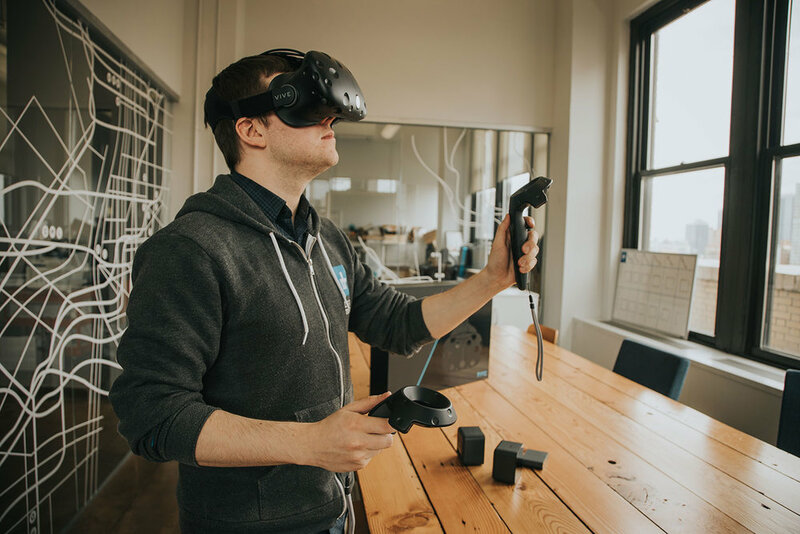 One company, Virtual Xperience, uses 3D modeling to let users wearing VR headsets access full walkthroughs of properties that are in development or under construction. Developers can use the company’s technology to create customized color palettes, materials, furnishing and lighting conditions, to help buyers personalize and visualize the unbuilt properties, Forbes reports. The company offers 2D images, 3D walkthroughs and a 3D flythrough video experience. Want to get the details on a house you like in the neighborhood without looking up the listing? Realtor.com’s updated Android application now has a feature called Street Peek that uses AR to display details about a home when users point their phone’s camera at it. “Even if the house isn’t for sale, you’ll still see all the important details from the real estate website’s database,” Engadget reports. The app offers details like listing or rental price, recently sold price, estimated value and the number of bedrooms and bathrooms in the house, and can even deliver that info on groups of houses at the same time.